With over 680 plus dealers in the nation competing to be the best in dealership operations, employees, facility, sales performance, customer satisfaction and customer service – only a few dealers are given the prestigious Bar & Shield Circle of Recognition Award. Harley-Davidson brand has such tremendous customer loyalty because of the efforts of its dealers. Orange County Harley-Davidson was awarded Harley-Davidson Motor Company’s Bar & Shield Circle of Recognition Award for the 2011 calendar year. Orange County Harley-Davidson earned the Circle of Recognition Award for the West region based on their motorcycle and related product sales performance, an evaluation of customer service and satisfaction, and various operational measures. Orange County Harley-Davidson, 8677 Research Drive, Irvine, CA 92618, has been in the Orange County area since 1989. 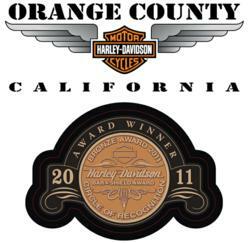 Orange County Harley-Davidson has also earned this award in previous years.